2) When scrolling over this area, plus signs will appear on the right side of each section. 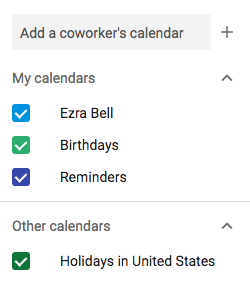 Click the plus sign next to "Add a coworker's calendar" and select "New calendar" from the list. 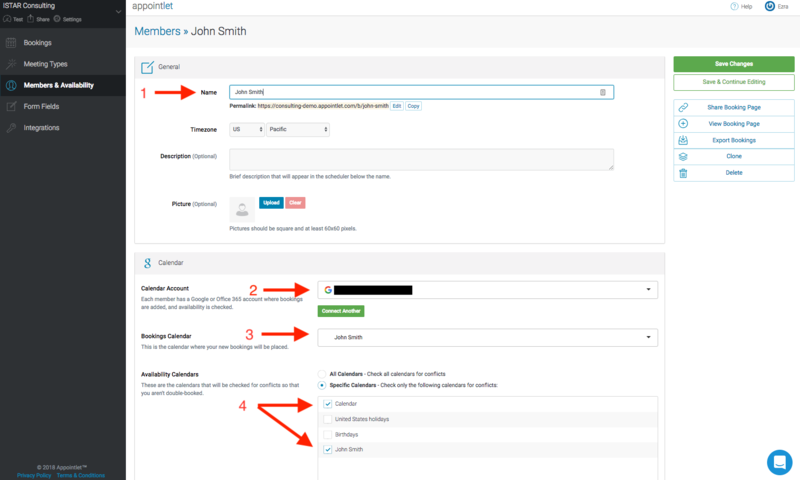 Within the modal that opens up, enter the name of your member and click create calendar. 3) The new member will show up in your list of "My calendars". 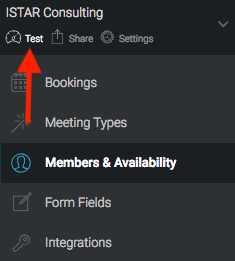 Hover over the member's name and click the three-dots icon, then select "Settings and Sharing". 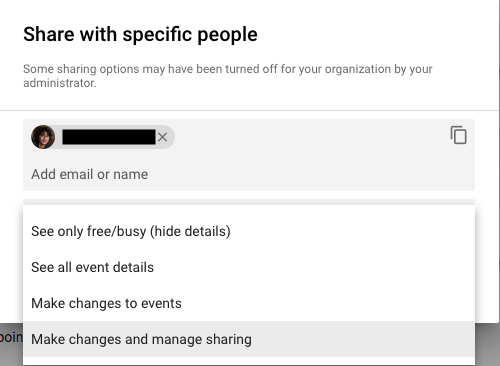 5) In the new screen, you will be prompted to type in the name of the member's gmail account and then select "Make changes and manage sharing" from the dropdown menu below their account. Finally, click "send" to fire off the request. The member will receive an email asking them to confirm that they want to grant your account permission to read and write events on their calendar. 6) From the member page, enter the Member's name and then scroll down to the calendar section. If your top-level calendar account already exists in our system, you can select it from the dropdown list. Otherwise, click the green "Connect Another" button to add it. As you can see in the image above, once you've added your Calendar Account, the shared calendar you created (e.g. John Smith) will now show up in Bookings Calendar and Availability Calendars. Select their name in both areas to ensure that they receive bookings and that the system checks for their availability correctly. 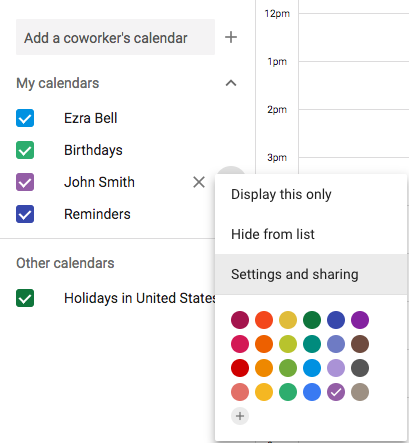 In the example above, Appointlet will ensure they area available in their general calendar category (Calendar) as well as the custom calendar you just created for them (John Smith). Finish configuring the member's schedule (guide here) along with any other customization that you want. When you're finished, hit the green Save Changes button at the top right of the screen. 7) Finally, you can test that this worked by clicking the test icon and completing the booking flow process for that member. 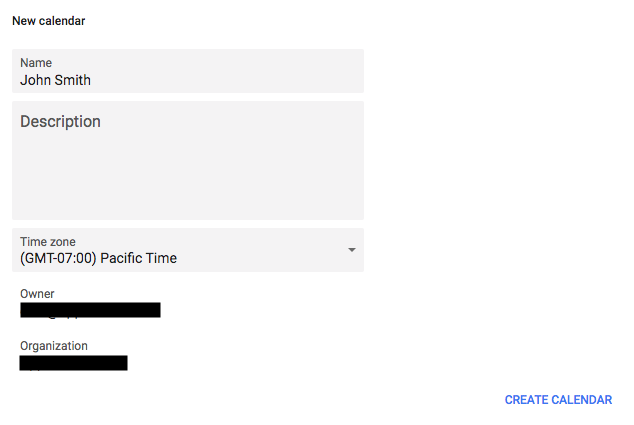 8) If you followed the steps correctly, then upon completing the booking, it will show up in your Bookings Dashboard and the event will be written to that member's Gmail calendar. You can repeat this process for each member of your team.